The 7 year old and I have been trying to make various things with the HP Sprout (review soon) and Dremel Printer. I was sent review versions of both to explore and give feedback on. We’ve learned a lot and filed a lot of bugs and received lots of great software updates. About two months ago we tried 3D scanning an object using the Intel True Sense camera and manually rotating a 3D object on the HP Sprout’s touch pad. I was both impressed and unimpressed with the results. Impressed because 3D Scanning is a biscuit away from straight magic. Unimpressed because it was a tedious process and the result was a little chopped up. But then the Spout folks sent over a “HP 3D Capture Stage” for me to try. I’ll be totally honest, I thought this was going to be a cheap rotating circle, basically a Skylander’s portal with a motor. I couldn’t be more wrong, this thing is built like a TANK. It’s actually a rotating stage split on an angle that connects via USB and allows the Sprout to angle the object between 0 and 15 degrees, however it likes. Combining this with both a 14 megapixel camera AND an Intel RealSense Depth Camera, the results are significantly better than my first attempts. The HP 3D Capture Stage is $ 299 by itself, which is admittedly not an impulse purchase. The price point that I’m impressed with though is the “Sprout 3D Maker’s Bundle” which includes the HP Sprout itself (no slouch with an i7 and 8 gigs, stylus, and 23″ touchscreen + 20″ second screen/touch mat) AND the 3D Capture Stage AND a Dremel 3D Printer all for $ 2999. (US$ 3k) That’s the Sprout with the Dremel Printer and the Capture Stage is free, essentially. ASIDE: It blows my mind that I got a loan from the bank and paid $ 2,800 for a 486DX/33 in 1990 and today I can get something like a Sprout AND 3D Scanner AND Printer for about the same. Seriously, Star Trek: The Next Generation is coming. Through in an Oculus or a HoloLens and we’re living in the future. OK, first things first. Can you scan an object, get a perfect model, then 3D print the same object? Essentially photocopying/xeroxing 3D objects? No. But you can get a VERY nice 3D model of a real physical object in just a few minutes and then export it to your favorite app for manipulation. Here’s my FIRST scan where I sat for 15 minutes and rotated a teapot 15 degrees each time the computer told me to. Not so good. And I was VERY careful and accurate, I thought. 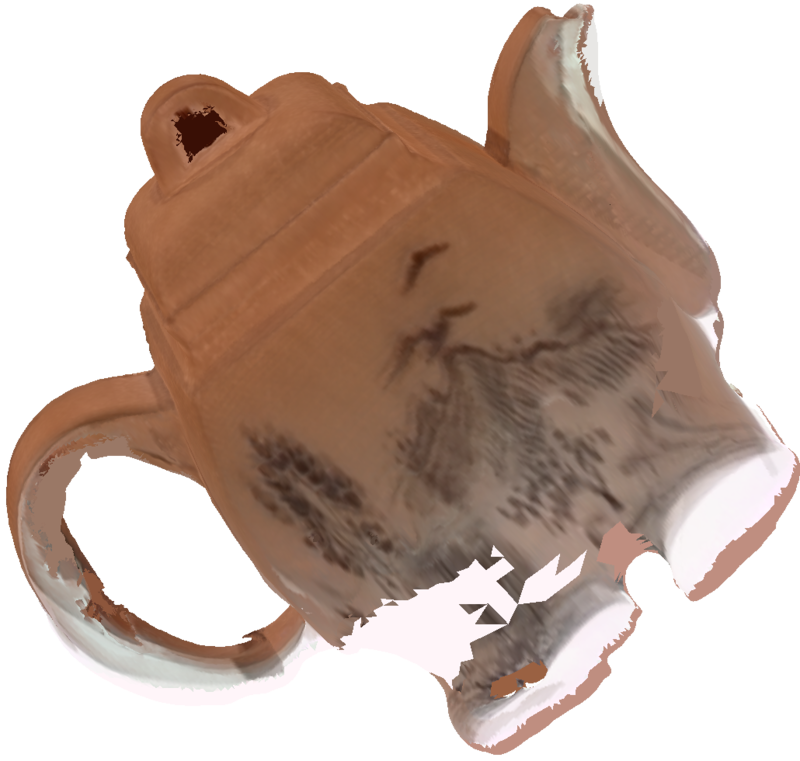 Here’s the SAME teapot on the 3D Capture Stage. I used the supplied putty to gently stick the object on the stage at an angle. Here’s a video of the start of the process. It’s totally automated, but after you’re done if you feel the object wasn’t completely represented you can put it on its side or flip it over to get occluded sides. I did scans a total of 3 times and got this auto-merged result. While the lettering got blurred after the second scan, the general structure of the teapot is 95% correct. I exported it into the Microsoft 3D Builder Software and got this result. 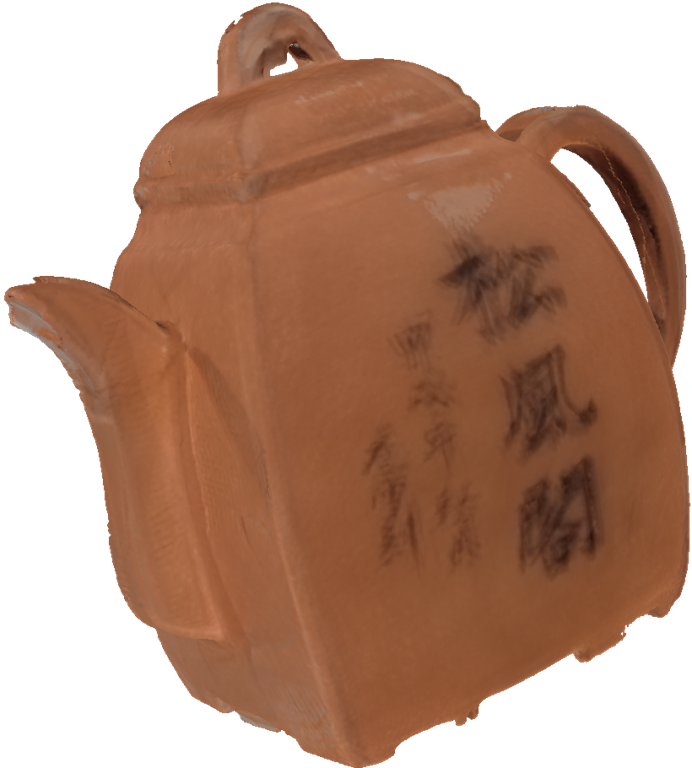 It’s also worth noting that the 3D scanned object and the textures are totally separate now, so if I wanted to make a red wooden teapot from this scan, I could. The 3D Scanning Stage could be a great way for a burgeoning game designer to collect unusual objects, obtain textures and texture maps, and really jumpstart a 3D model. So far the whole thing has been amazing. The software has been continually updated, and while it’s not perfect, it’s definitely cool. My kids of been doing 2D stop-motion animation and my wife has been using it for scrapbooking. A full review and YouTube Video is coming soon, but so far I can tell you that the HP Sprout is not just a fantastic “Kitchen PC” and a “Maker PC” but I could really see it being my family’s primary computer. That said, the real place it shines is in education. I’d love it if my kids had a complete PC/scanner/printer combo available to them in their classroom. Sponsor: Big thanks to my friends at Infragistics for sponsoring the feed last week! Responsive web design on any browser, any platform and any device with Infragistics jQuery/HTML5 Controls. Get super-charged performance with the world’s fastest HTML5 Grid – Download for free now! © 2015 Scott Hanselman. All rights reserved.